The Pathumwan Princess Hotel, with its tastefully decorated rooms and suites, is situated in the heart of Bangkok's entertainment and retail shopping area. A key location near the interchange Skytrain Station, means commuting around Bangkok was never easier. 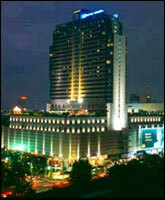 The Pathumwan Princess Hotel houses 462 tastefully decorated fully air-conditioned superior guestrooms and suites. Select TV channels featuring CNN, Discovery Channel, STAR Sports, Bloomberg, CNBC and a variety of 24 hour in house movie channels, IDD telephone, fully stocked minibar refrigerator and personal safe. Spacious private bathrooms equipped with bathrobes, Pathumwan Princess’ own line of toiletries and a telephone extension. The furnishings are luxurious and feature color co-ordinated themes. Guests can choose between the superior single or double bedrooms in 34 square meters area. Non- smokers are encouraged to request for smoke-free rooms. Guests can also have the option of staying in our deluxe rooms. All the modern conveniences for today’s lifestyle artfully laid out in a spacious 42 square meters area. Should ultimate luxury and comfort be your goal, the Pathumwan Princess Hotel pulls out all stops and rolls out the red carpet. Our suites have up to 77 square meters, wall-to-wall carpeting, High Speed Internet expansive views and all the top-of-the-line fittings that come with a suite and more! Longer term staying guests can have the option of registering in the Pathumwan Princess Hotel’s EXECUPLUS SUITES suites have 64 square meters, suitable for corporate clients, business executives and families, with ultra- modern facilities. Amenities include 2 sets, stereo and CD player, private in-room safe and a full sized living room. The attached kitchenette has coffee and tea making conveniences, cutlery, chinaware and a fully stocked large fridge. A working desk, personal voicemail message facilities and two telephone extensions are provided, High Speed Internet. Personalized services with separate express private check in/out. Doing business at the Pathumwan Princess Hotel can be a breeze. It’s made easy by a well equipped business facility, coupled with ever ready staff to attend to your every need. The Business Center at the Pathumwan Princess Hotel is a nucleus for incoming and outgoing business. Fitted with top-notch, ultra modern facilities, and personal secretarial services, it feels like working out of your own office. For guests staying at our EXECUPLUS Suites, you don’t even need to step out of your room when doing business. Each room is fitted with a desk, personal voicemail message facilities, High Speed Internet connection for your laptop, facilities for computer usage, direct line option, secretary services, rent laptop, mobile phones, etc. Stay at the Pathumwan Princess Hotel and let us take care of business for you. A profession one step event service or whether organizing a buisiness private parties. We have a wide range of flexible package or alternative we can meet and arrange your unique and own specific event requirement. The Olympic Club is set on a sprawling 600 square meter area, and is already known as one of the best equipped clubs in town. Equipped with the latest Cybex exercise machines, the Olympic Club is sectioned off into three distinctive parts. The first being, the reception area and cardio section. This is where guests and members can burn unwanted pounds and ‘love-handles’ with super effective cardio machines while being entertained by individual TV monitors. The middle section is exclusively for specific body-part training, where individual exercise machines can be used to tone and firm desired body sections. The final area is the free weight room. The whole area is so spacious, guests don’t feel ‘elbowed-in’ even during peak hours. Personal trainers will assist members to achieve health goals and work out an individual training program for each guest. There is also an aerobics room where group classes are conducted regularly. Members can opt for Step Aerobics, Yoga, Karate, Jazz Dance and other varied programs. The Olympic Club also has two well-lit, international standard tennis courts, two indoor squash courts with adjustable room temperatures, badminton court, basketball, table tennis and a 1-kilometer jogging track! After an intense sweat-inducing session. Perhaps you may want to go for a few relaxing laps? Dive in! The Pool is Bangkok’s only salt-water chlorinated pool in a hotel. It’s gentle on the skin and eyes. Also two newly designed jacuzzi hot & cold pools offer a breath taking view of Bangkok, while lounging in comfort with exotic cocktails, only at the poolside of the Pathumwan Princess Hotel. Our doors are now open for you to explore a journey into a serene and tranquil environment with Thailand's glorious testaments to sensual science. Within this oasis, a delicate balance your body and mind is nurtured with tender care. Our spa programmes are designed to tune your body as you relax in one of the 15 spacious, state of art treatment rooms. The private treatment rooms overlook a private garden and offer a meditation and doctor's room to find your physical needs. Our decor has been inspired by 14-16th century Thai Art to create a tranquil environment that will provide unforgettable nurishment during your visit. The spa facilities area of 730 sq meters duplex. TANTARA HEALTH SPA ready to service at Pathumwan Princess Hotel. Whether you are an active leisure traveller, with family on vacation or a busy executive wishing to be in the midst of Bangkok's largest shopping and entertainment complexes, you will find a dining experience in the hotel that will definitely suite your taste. Authentic Japanese food in contemporary surrounding at Nabe-Ya. Charcoal BBQ Korean at Kongju. European and Asian fusion at Loop (poolside). Or International and Thai cuisine at the 24 hour Lobby Bistro. - Full sprinkler system/heat detector in all guestrooms and throughout hotel.